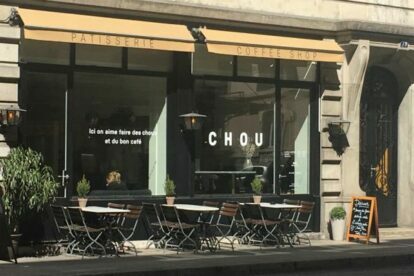 One of the many reasons I love Chou, a cute coffee shop with a Scandinavian vibe, tucked in at the end of Eaux-Vives, near the Parc de la Grange, is because it is opened on Sunday from 9 am to 1pm. On Sunday, unfortunately and for some strange reason that I do not fully understand, the city of Geneva shuts down. Except for…Chou! I love waking up relatively early on the weekend and start my day with a delicious coffee, definitely one of the best in the city, served by the attentive and friendly owner, who will make sure that you enjoy your time in his coffee shop. It’s quiet and cozy; I take the time to read the news, to relax, breathe, contemplate the time passing by, to just enjoy life. Chou is the perfect place to read a book and catch up with your inner self. On Sunday morning, I love to get a soft-boiled egg and a few “chouquettes” (small puff pastries sprinkled with sugar pearls) with my cappuccino. It is the best start to a lazy and/or productive Sunday!